Giant Garden Games are perfect for entertaining visitors of all ages at your event. Children and adults love playing with the Giant Garden Games as the whole family have the opportunity to get involved. 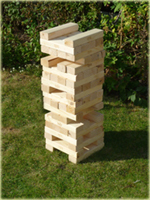 Our Giant Garden Games collection includes Mega 4 in a Line (Giant Connect 4), Giant Jenga (High Tower, Stacking Tower) and Giant Noughts and Crosses. The Giant Garden Games are perfect for any event as they can be used as an activity game at an Activity Day or as a filler in between other activities. The Giant Garden Games are suitable for both indoor and outdoors use. Mega 4 in a Line (giant connect four) is a giant version of the well know Hasbro family game, Connect 4. Our Giant Game is the biggest and most robust giant version of this classic Connect Four Game. The Mega Four in a Line stands 1.1m tall and requires a combination of strategy, skill and of course a bit of luck in this giant version of the well known game. This game is perfect for Activity Days and is suitable for two players or two teams working together to connect four discs in a row. Our Giant Connect 4 (Mega Four in a Line), like all of our activities, can be branded with your company logo, or art work. Giant Noughts and Crosses consists of nine interlocking foam tiles to create a giant version of this classis game. Suitable for all of the family, this game is perfect for any of our Activity Days. PLEASE NOTE: Due to the low value of this hire item, it is not feasible to supply this activity for hire on its own but only as a package alongside our other activities.